So I'm guessing we must be around six months in and I know I am not half way through my planned makes, but hey ho....I have six months to work on it! First up, was a Christmas present I made for my Mum. Made in three different yarns, almost four, but I reigned myself in! This was knit with two different shades of four-ply sirdar snuggly, the third was a part ball that I bought in Wonderwool last year. 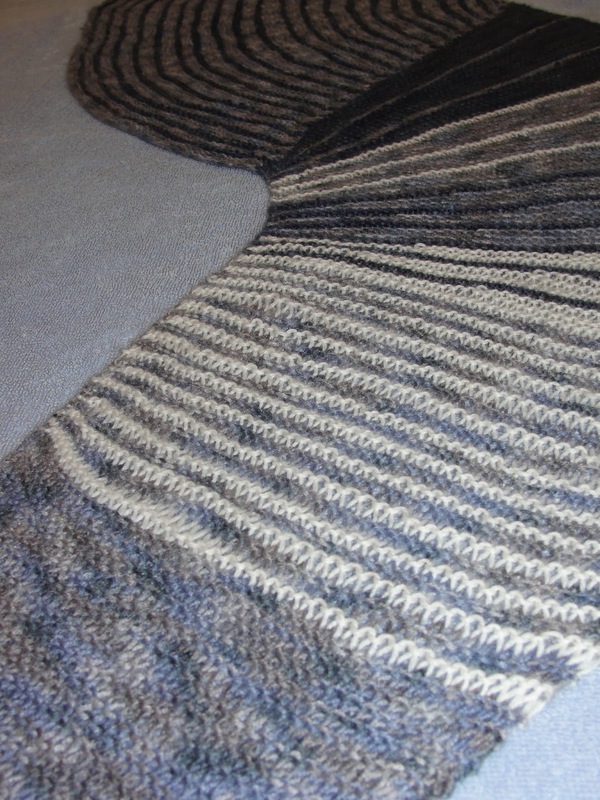 It is another wonderful pattern, not a uniform shape like the other shawls I have knit. You knit the first triangle, then cast off and pick up stitches along one side. The curves are formed with short rows...but what really grabbed me, is the stripes....it is all about the stripes. To finish of the gift, I bought another beautiful shawl pin from Begemmed this time with a Mother of Pearl stone to set off the hammered finish......another beautiful piece. Changing up the 'soothing on the eyes' colours, you may want to reach for your sunnies! 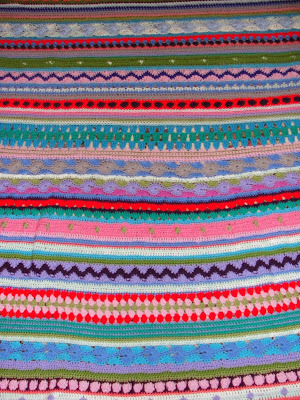 I have finally finished my Little Woollie Mixed Stitch Stripey Blanket This has been my post Christmas crocheting project. 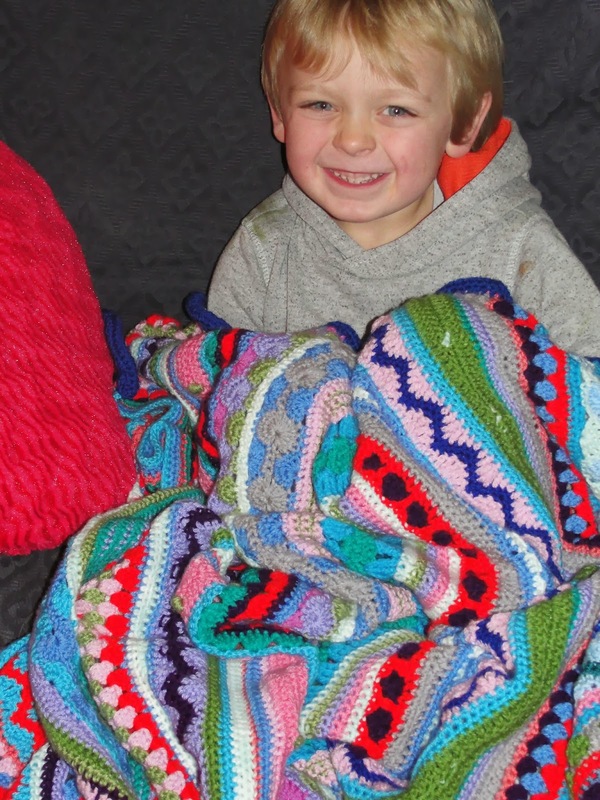 I have picked it up and put it down over the past year and a half....it has been a fun project....and the finished blanket has already been snapped up by my littlest boy....that makes me smile from ear to ear when the things I make are claimed before they are finished. This was made with Stylecraft Special DK mainly, and a few other acrylics thrown into the mix, it has certainly knocked back some of the weight off my yarn shelves. 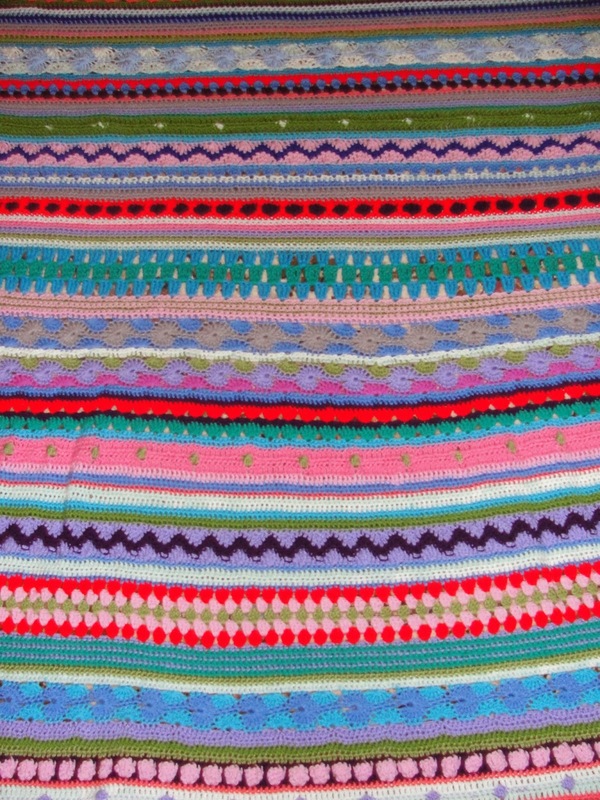 So there we have it...I have started a new project on the list...a temperature blanket....but more on that next week! 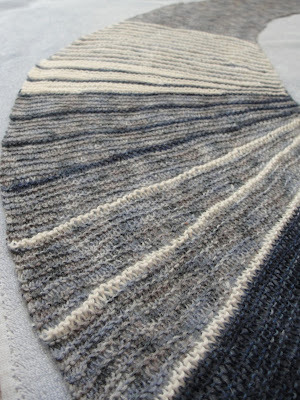 To see more YOP work, check out the ravelry page here. I like all the tonal greys in your mum's scarf. I'm so into neutrals. The blanket is cuddly fun. They usually get stretched out from so much use so one can't tell. It's self-expression at with all the fun rows. 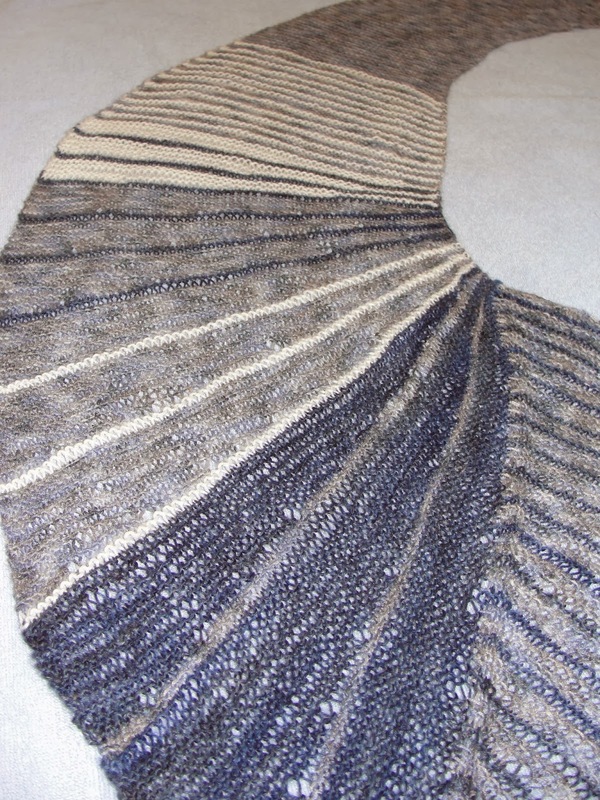 First, the shawl is gorgeous, look how far your knitting skills have come, short rows, you are my hero!!!!! 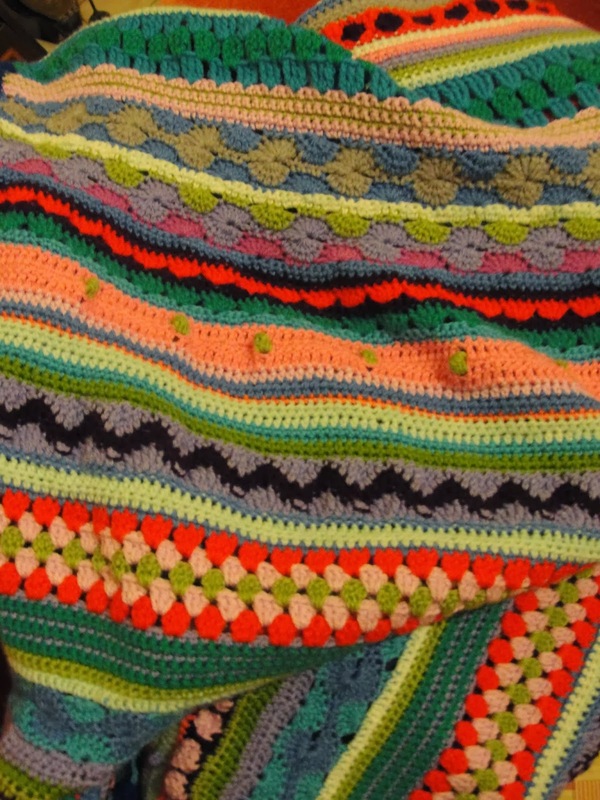 As for the blanket, gosh how frustrating, but who said a blanket has to be a rectangle? Maybe you are onto a whole new thing, I mean I like a wider end to cover my shoulders and narrower at my feet might be perfect. Look you are a genius with your new blanket shape discovery! Oh! That shawl looks amazing, I'm so jealous of your mom! 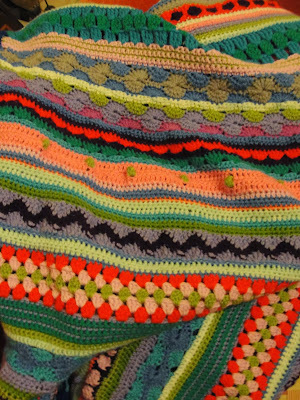 ;-) I'd love to make something like that one day.. And that blanket is really fun, who'd even notice the sizing? Just look at the colors!! I'm sure your mum was thrilled with her beautiful shawl Faith and another very pretty shawl pin too...I do love them and I'm keeping them in mind if I make a shawl this year! The shawl is lovely and I can see why the blanket was so quickly claimed. Who's to say the trapezoidal shape isn't an intentional design? I bet it adds something fun to the blanket anyway. Loving the shawl, nicely done. It's been all about stripes with me lately too.